‘Shinkawa Dai-jingu’ is a Shinto-shrine founded in 1625(Edo period),　and is dedicated to guardian deity of Sake-dealers. At the annual grand festival (Rei-taisai) in October, a traditional ceremony ‘Shinkawa-Jime, is performed by Sake-dealers. “Shinkawa Dai-jingu” illustrated in the “Edo Meisho Zue“*. *The topography on the late Edo period. 1. Pass through the torii gate. 2. 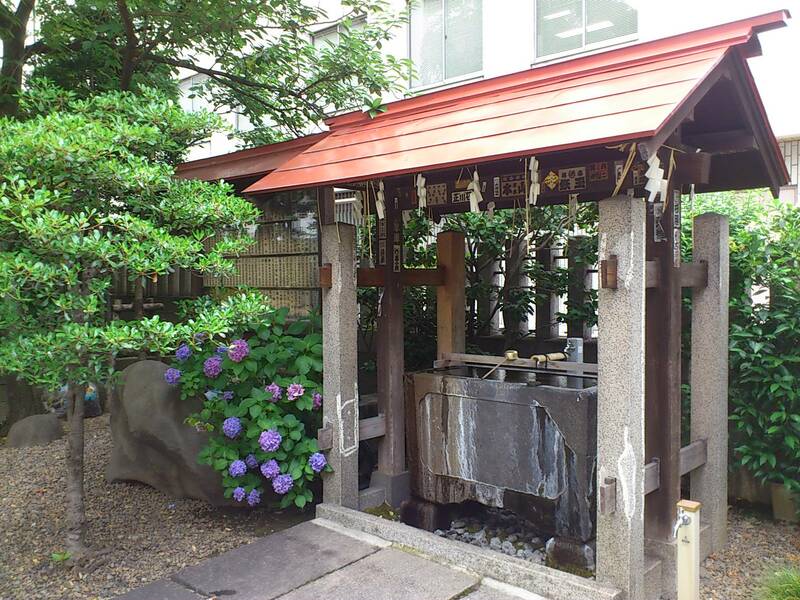 Purify your hands and mouth at the “temizuya” water pavilion. First, scoop up water in a ladle with your right hand and pour water over your left hand. Next, hold the ladle with your left hand and pour water over your right hand. In your left hand, take some water that you have scooped with the ladle and rinse your mouth. Never touch the ladle directly to your mouth. Lastly, using the remaining water, tip the ladle to rinse it off. *You only scoop up water one time, at the very first step of the process. 3. At the altar, bow twice, clap your hands twice, and then bow once to pray（2礼2拍手1礼）. Quietly throw in a “saisen” coin into the “saisenbako” offering box. The “saisen” coin is an offering to the deity. With your hands still together, express your feeling of gratitude in your mind without speaking.